The Association of English-language Publishers of Quebec, the Quebec Writers’ Federation, the Montreal Review of Books, and Maisonneuve Magazine present:Rapid-Fire Reading, Ricochet Writing: mRbilia Edition! This fall the Montreal Review of Books turns 20! To celebrate two decades of great writing about great writing, we’re taking over the 2017 Holiday Pop-Up Book Fair for a whirlwind hour of reading and writing. Participating writers: Louise Abbott, Tom Abray, Jonah Campbell, Chris DiRaddo, Bonnie Farmer, Trevor Ferguson (John Farrow), Ariela Freedman, David Homel, John Kalbfleisch, Alex Manley, Lorina Mapa, Karen Nesbitt, Sylvain Neuvel, Claire Holden Rothman, Sherry Simon, Mary Soderstrom, Carolyn Marie Souaid, Gillian Sze, Blossom Thom, jia qing wilson-yang. Plus special guest Ricochet Reader Colleen Curran! 20 writers will read for no more than two minutes each, and each writer will contribute to a collective text that will be read at the end of the event. Rapid-Fire Reading, Ricochet Writing has been presented twice before by the Quebec Writers’ Federation, to great enjoyment. 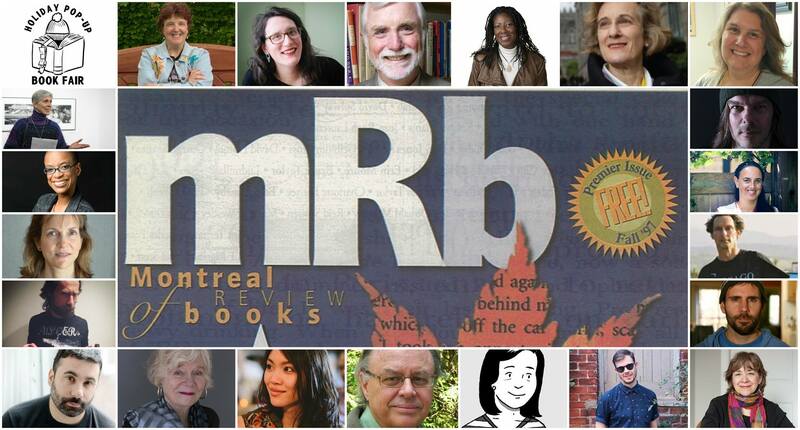 For this special mRb edition, each writer has some connection to the Montreal Review of Books: they’ve been reviewed or featured, graced the cover, written a review–and in some cases all of the above! Books by all participating writers will be available for sale at the Book Fair. Thanks to Maisonneuve for sponsoring this event! And thanks to the Department of Canadian Heritage, the Canada Council for the Arts, and SODEC, without which the Montreal Review of Books and the Holiday Pop-Up Book Fair would not exist.